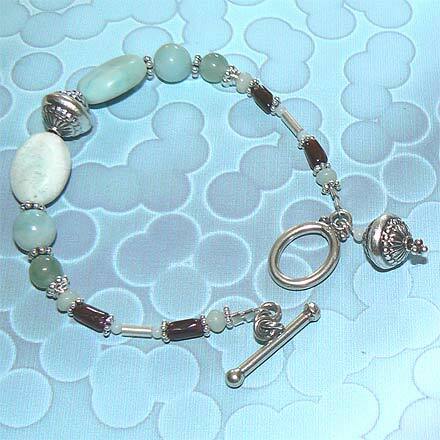 Sterling Silver Amazonite and Garnet Bracelet. This is one of those color combos that I just love...pale, pale green with dark magenta or maroon. The assorted pale blue- and yellow-green shades of Amazonite set off the deep red garnets so well. The matching bracelet is 7¾". For those who are interested in Astrological significances of stones, Amazonite corresponds with Virgo and Garnet corresponds with Capricorn, Aquarius and the month of January.